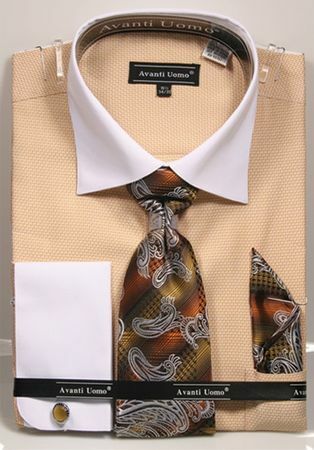 When you like your fashion colors when it comes to dress shirts for men and like your style with a bolder look, Avanti Uomo makes the Italian style dress shirts for you. Featuring style designed in Italy with an unconventional look, these dress shirts are made for men who care about style and fashion. This mustard herringbone pattern dress shirt has a subtle herringbone texture fabric with french cuffs and the matching tie combination ready to make your style come alive. Fabric is all cotton. Find More French Cuff Shirt and Tie Sets Here.